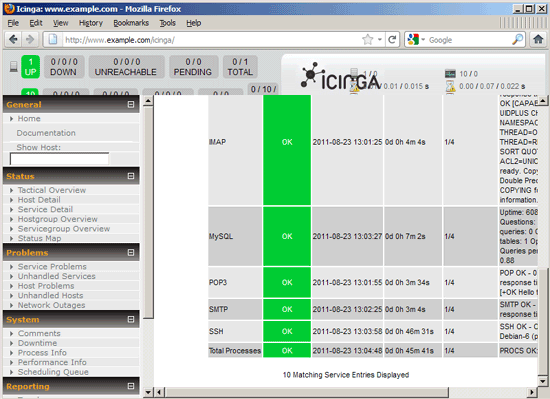 The main Icinga configuration file is /etc/icinga/icinga.cfg, additional configurations are stored in /etc/icinga/commands.cfg and /etc/icinga/resource.cfg. Usually the default configuration is ok, so you don't have to change these files. 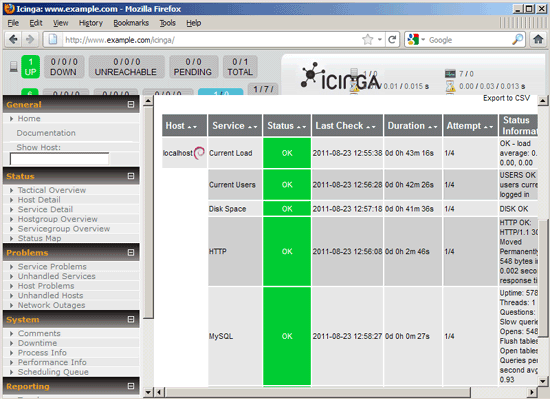 # defined in icinga-common_services.cfg may also apply. command_line    /usr/lib/nagios/plugins/check_by_ssh -H '$HOSTADDRESS$' -C "/usr/lib/nagios/plugins/check_disk -w '$ARG1$' -c '$ARG2$' -e -p '$ARG3$'"
As you see, the check_all_disks command is defined as /usr/lib/nagios/plugins/check_disk -w '$ARG1$' -c '$ARG2$' -e. If you take a look at the /etc/icinga/objects/localhost_icinga.cfg file again, you see that we have the line check_command check_all_disks!20%!10% in it. Icinga allows us to pass command line arguments to service checks by separating them with an exclamation mark (! ), so check_command check_all_disks!20%!10% means we pass 20% as the first command line argument and 10% as the second command line argument to the /usr/lib/nagios/plugins/check_disk -w '$ARG1$' -c '$ARG2$' -e command so that it finally translates to /usr/lib/nagios/plugins/check_disk -w '20%' -c '10%' -e.
If you want to pass a command line argument that contains an exclamation mark, you must escape the exclamation mark with a backslash: \! With this knowledge you can modify the service checks in /etc/icinga/objects/localhost_icinga.cfg to your likings, and you can add/modify plugin configurations in the /etc/nagios-plugins/config directory. As you see, the SSH ang HTTP service checks are defined here.